That 5K race you signed up for is now only two weeks away and you haven't gotten around to training for it. Or, you may want to join a race you just heard about but you've been inactive. You will need to decide whether you should do the race or not and what the consequences may be if you give it a try. Your current fitness level is a big factor. Five kilometers (5K) is 3.1 miles. Some people are fit enough to easily run that distance without any training, while other people might be really suffering and find it difficult to complete the 3.1-mile distance. Beginners can complete 5K race in 30 to 40 minutes at a running pace​ or 45 minutes to an hour at a walking pace. If you describe yourself as a couch potato and have been sedentary for a year, you should probably talk to your doctor before taking on a 5K without training. You should definitely get medical clearance if you're overweight, have a family history of heart disease, or have an existing medical condition. Even with your doctor's approval, you may find that attempting a 5K after being sedentary for so long will not be a fun experience. You may want to choose a different 5K race that is farther the future so you'll have more time to prepare. If you’re already an active person and have been doing other forms of cardio exercise (biking, swimming, walking, etc.) at least a couple days a week, you may be able to complete the race even if you haven’t been running on a regular basis. Can You Switch to a Shorter Route? Check the race information and see if it's possible to switch to a shorter distance. Some events have a 3K walk available and don't penalize you for switching. Many 5K races are walker-friendly and you can run a little and walk a lot or simply enjoy a walk. If you haven't trained for a 5K, but really want to do it, you may want to use a run/walk technique. The run/walk method involves alternating between intervals of running and intervals of walking. Taking short walking breaks allows you to run for a greater percentage of the race, as opposed to running without stopping for a distance and then having to walk for the rest of the race due to fatigue. The run/walk technique is also safer for untrained runners because the walk breaks reduce the pounding on your body and reduce your risk of injury. Give it a try a couple of times before the race. Although two weeks is not a lot of time to prepare for a 5K, it’s possible to still get yourself more mentally and physically ready for the race. If you’ve been exercising a few times a week, take a look at the last two weeks of a 5K beginner four-week schedule and see if it looks doable to you. On such a schedule you will be running for 24 to 30 minutes twice a week. Keep in mind that you don't have to run or run/walk 5K before the race in order to be able to complete the distance on race day. If you're able to run or run/walk for at least 20 minutes, you should have no trouble with the 5K. Whatever you do, don’t try to cram for the final exam. Running really hard and long in the two weeks leading up to a race is not going to better prepare you for the race. Your body doesn’t make the physical adaptations until 10 to 14 days after training, so intense training in the two weeks before will not help you. It may actually have the opposite effect and leave you feeling sore and fatigued on race day. You may even end up with an overuse injury by doing too much too soon. It’s better to do two or three easy runs of 20 to 30 minutes during the week before the race. Take one or two days off before race day. If this is your first 5K you will want to get familiar with the lingo and what to expect. You should familiarize yourself with the rules and the course setup. Check the race's website for details. You might even visit the course to see what it looks like. Check your running shoes. It's not a good idea to use new gear on race day, but you don't want to wear a pair of shoes that is broken down, either. If you don't have appropriate shoes, go to the best running shoe store in your area and get fitted for a new pair. Then wear them walking and on practice runs before race day. Plan for your race day outfit and wear it on your practice runs. It's best that both tops and bottoms are made of sweat-wicking technical fabric rather than cotton. If your usual workout clothes won't do, shop at the running shoe store. Many 5K races have a fun theme. If you've already decided you will take it easy during the race, you might even consider wearing a costume. You'll get cheers from the crowd and greetings from the other racers no matter how slow you go. Relax and have a good time. 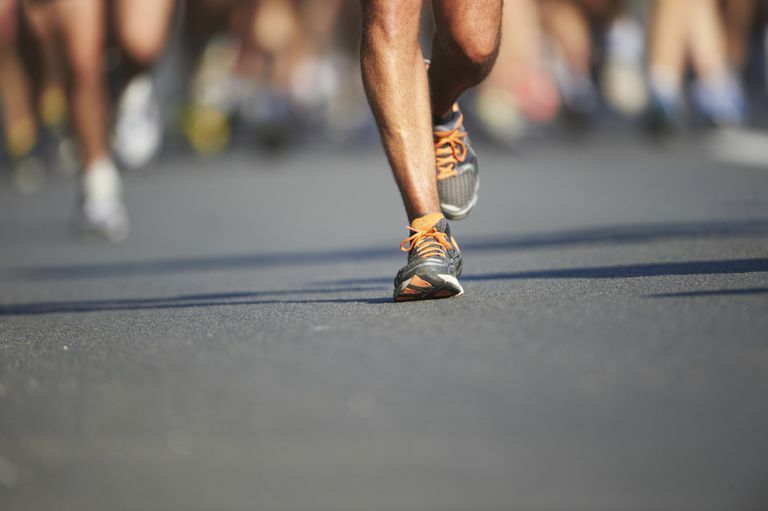 One common problem to avoid is running or walking faster than you should during the race. Because you haven't fully trained, this is especially a risk of an injury. Hold yourself back and enjoy an easy pace. Save the speed for a race after you have fully trained. It will only be between 30 minutes and an hour of racing, even if you walk. Slow racers likely get the same medal or other rewards at the finish, so you'll still take home the prize.